Like TVs, computers and… well, every other type of technology, true wireless earbuds have gotten very good at lower price points. Just a couple of years ago, even wireless earbuds came with many trade-offs like battery life, hiss, and unreliable connections. But these days you can get a solid pair of true wireless headphones for around $100/£100. The only problem now is it can be hard to choose between them all. For bass lovers, the Skullcandy Push offers it up in spades and for $130 (£100, about AU$186), you get a pair of headphones that offer 12 hours of battery life, excellent fit, and passive noise isolation. So are these the pair you should buy? Probably not. While we enjoyed the Push’s fit and physical controls, its overwhelming bass, cheap build, and underwhelming battery life make it hard to recommend. While the paint looks good, the headphones and case feel cheap and plasticky. The lid also isn’t spring loaded so you’ll have to manually pry them open. Speaking of, we were surprised at the size of the charging case, which is much larger than the competition but only offers one extra charge for the headphones – i.e. the earbuds themselves last for six hours, plus the additional six from the charging case gives the headphones a total 12 hours of life. The news here, however, is that we’re happy to see that USB-C charging is available on the case, allowing for faster charging and compatibility with today’s smartphone cables. 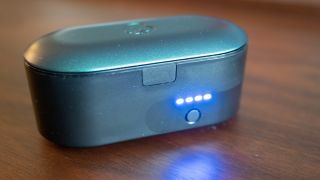 We weren’t so happy with the blue LED battery status lights on the charging case as they are extremely bright as it makes them distracting at night when you’re trying to sleep, but it’s not a deal breaker. The earbuds themselves are quite large when viewed on the side but they’re actually quite slim, sitting closely to the ear. They come with the company’s FinFit wings, which help keep the headphones steady during exercise. While Skullcandy claims the headphones are “water resistant,” the company doesn’t list an IP rating… which doesn’t inspire confidence. Users control the Skullcandy Push via the physical button on each earbud. We prefer physical controls to touch and the Skullcandy’s are good. The buttons provide a good tactile feel and you can control everything from music playback, volume, and your phone’s voice assistant on the headphones. Skullcandy stands out in a crowded headphone market by offering bold design and bass you can feel. These headphones have an extremely warm sound signature with bass overwhelming everything else – vocals and highs are buried under a mountain of messy, bloated bass. In terms of reliability, the Skullcandy paired with our iPhone XS every time but we experienced some audio cut outs on the right earbud from time to time. (For context, the right earbud is the slave.) The cutouts were difficult to replicate but happened both while walking around the city and sitting stationary at home. In terms of battery life, the Skullcandy’s battery life is a mixed bag. While it’s impressive that the earbuds themselves last up to 6 hours, a number we hit during testing, the case only offers an additional 6 hours. Other headphones like the Amps Air 2.0 offer a ridiculous 45 hours of combined battery life and its case isn’t much bigger than the Push’s. Skullcandy got some things right with the Push, its first ever true wireless headphone. The design, fit, comfort, and physical controls are highlights. But unfortunately we just can’t recommend them due to their below-average battery life, occasional connection problems, and headache-inducing bass. For the same price, we recommend bass-lovers go with the Sol Republic Amps Air 2.0 as it offers tighter bass, digs deeper, and you’ll get a ridiculous 45 hours of combined listening time. 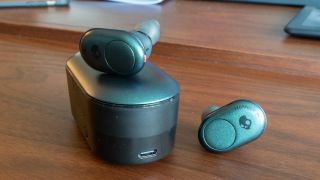 If you can spare a bit more, step up to the RHA TrueConnect, which offer stellar build and audio quality for the price, or the slightly dated Jabra Elite 65t, which are still one of the best true wireless headphones you can buy.